When I say we have tons of leaves in our yard, I'm not exaggerating. How many leaves are actually in a ton? How many of those plastic bags will it take to collect them all? How many pickup truckloads to haul them off? How much compost will they produce if they're piled up? What about burning? When we moved into our present home fifteen years ago, the first thing I fell in love with was the mature grove of pin oaks, dogwoods, hickory, and maples that were on, and around, the property. In just a few months, we were overwhelmed and not equipped to handle the knee-deep yard of leaves. The neighbors strongly suggested we not leave them on the ground, or put them on the garden, because they would kill or smother everything! I won't go into detail about the numerous methods we have tried, or the expense, to manage the yard of leaves over the years. Instead, I'll share what we have learned about leaves to help you decide whether you can appreciate them as we have, calculate what is needed to manage them, and hopefully put them to good use. CY totals rounded up to whole numbers. We wanted to estimate the volume of leaf fall to determine the type and size of equipment that might be needed to transport and manage the tree debris, as well as the volume and weight capacities of equipment and containers we might use. Simple math, using the dimensions of the yard and the total depth of seasonal leaves, would tell us the volume. Consult your deed plat for property dimensions, or tax tickets for amount of acreage. Here's a quick video (1:23 minutes) on "... How to Calculate Cubic Yards" for those, like me, who learn more visually, or you can just use the chart for estimating purposes. If you want to further refine your calculations, you could subtract the SF area of your house and outbuildings, but it's not necessary for a ballpark figure, just use a lower leaf depth. We are working with 1-1/2 acres of property that is actually mowed and leaves gathered. During the leaf season, November to February, we estimate a total of 3 feet of leaf depth. Using the "Calculating Cubic Yards of Leaves" chart at left, that gives us 7,263 CY of leaves every season! An Internet search turned up several conflicting weights for leaves. There are many variables like: loose leaves, dry, wet, how wet, shredded, compacted, or mixed with other matter (grass clippings, twigs, etc.). I found claims of 10:1 to 20:1 ratios for leaf shredding machines on the Internet. I estimate our shed-vac machine at 10:1 (10 CY of leaves shredded down to 1 CY volume). That means we reduce our leaf volume from 7,263 CY to 726.3 CY. I estimated the weight of 1 CY of our shredded leaves to be around 300 lbs, since they are gathered shortly after falling. They are not completely dry and retain a bit of moisture, but not enough to clog the shred-vac. That calculates to a total of 217,890 lbs (726.3 x 300 lbs), or 109 tons (217,890 / 2000 lbs) of leaves to gather annually! No wonder we are so tired in the fall! Based on the final numbers (and a few years of other unproductive methods), we mow our yard with a riding lawn mower equipped to shred and vacuum yard waste, then dump the debris on a huge pile in the woods, out of the way, out of sight, and decomposing. What we have now is an accidental community compost pile with the sweetest smelling (to a gardener), richest black dirt that we have ever seen. 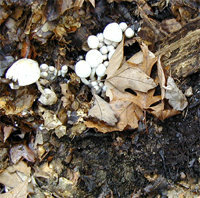 The wild mushrooms seem to like our mix of compost, too. Our "community” involves only four lots of our subdivision, a total of about 1-1/2 acres of yard waste, and a cross-section of people from elderly to a small weekday business establishment. To keep the leaves removed requires two people on riding lawn mowers with shred-vac carts (1 CY capacity each), and a teen with a leaf-blower, every weekend for a solid 6 weeks in the fall and a few light weekends in the spring. As the grass is mowed in the fall, the leaves are shredded, and sucked up together into the collection carts. Along with the mulched leaves, grass, and twigs, there is rotting fruit from two late-bearing apple trees, small piles of manure from the apple-eating deer, and various visiting cats, dogs, and other wildlife. All these carbons (C) and nitrogens (N) are combined into a mixture primed for relatively quick composting (see the C:N Ratios of Yard Waste chart at right). The community compost pile takes up a 40' x 40' area and is consistently over 5' tall. 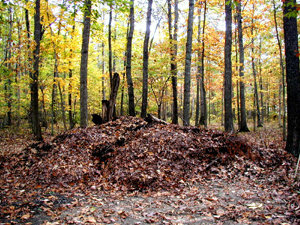 The leaves are dumped on one side of the pile and used from the other, finished side. Once started it became a perpetual source of compost for our gardens, spread as fertilizer for the lawn, sometimes as potting soil, and the unfinished compost (shredded leaves) are used for landscape mulch around the perennials. The numbers I found stated the reduction of waste materials into compost varied from 1/3 to 1/4 from the starting volume. With our shredded leaves and grass mix, I don't see more than a 1/2, or less, reduction of the pile. Shredding the leaves makes them easier to manage and creates more compost for the effort. We started out with 726.3 CY of shredded leaves. If they reduced by 1/2, we help create 363 CY of compost every season! By dry compost weight (540 lbs per CY), that equals a whopping 196,020 lbs, or 98 tons. 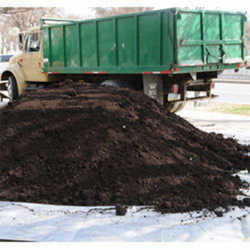 How much do you pay for packaged organic compost at your garden supply center? A short video (1:35 minutes) from P. Allen Smith, "Saving Leaves For Compost"
Other neighbors have various methods of dealing with the leaves. Some rake and blow them onto tarps to be hauled away on trucks and trailers to the landfill. Still others burn them in the drainage ditches along the roadway in front of their homes, or barren spaces among the trees, filling the subdivision with the heavy smoke. I intended to place the statistics (numbers) for the toxins released when burning leaves, however, I think we all know they are bad, regardless of what and how many parts per million they are. 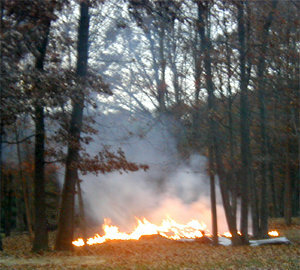 Years before we moved to the area, someone accidentally caught the woods on fire while burning leaves. Nobody was hurt, no houses were burned (a few roof shingles had to be replaced), but it was a horrifying experience for those involved. They now anxiously watch and wait for the leaf-burning season to end. The Environmental Protection Agency (EPA) and many municipalities are trying to reduce the amount of leaf-dumping in landfills, frown on the burning of yard waste, and encourage composting as the best economic and environmental solution to managing our leaves. 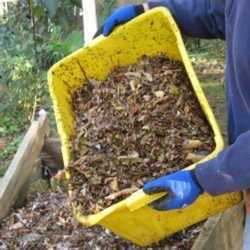 There is a multitude of free literature available on the Internet to help citizens with composting. Ask your local government representatives for information on composting programs in your community. Burning the leaves may be a tempting quick fix, but it was never an option for us with a big propane tank off the side of the patio, and a cautious husband working in the propane industry. I feel blessed for the multitude of trees and their leaves, while others curse them for the never-ending chore and expense they create. I hope you have found some numbers here to appreciate the potential of your labor, and put your leaves to work for you. Working with Mother Nature sure beats fighting against her anytime of the year! What's a Cubic Yard? : Average Pickup Capacities. Lake County California Public Services Department. Richard & Skelton. Fact Sheet 2. Cornell Waste Management Institute. 1990. Biernbaum & Fogiel. 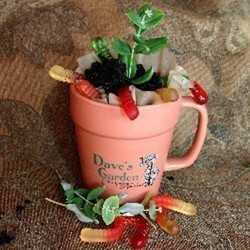 Crazy About Compost: Compost Production and Use. Department of Horticulture, Michigan State University. Feb 2005. Cornell University. About the Compost Mix Calculator. Klickitat County. All photos taken by, and property of, the author. "... How to Calculate Cubic Yards"
Related Info At Dave's Gardens!